I had the chance this past weekend to fly with my friend who is a skilled fixed wing designer and pilot. I discovered recently that one of the most enjoyable forms of FPV flying is chasing other aircraft around. One of the things we rarely do with FPV miniquads these days is fly to higher altitudes. When your up there with another aircraft, you're able to focus solely on tracking that aircraft. The trees, power lines, and all structure are left behind, allowing you to do certain maneuvers and hold certain orientations that would normally cause you to crash. In this case I was flying my 6" Rooster FPV to chase my friends wing, which was being flown LOS. It was a blast as always and I was psyched to see how well I was able to keep up. I have to give props to the guys at FT who film chase footage and to my friend who designed a wing that is so challenging to chase. That looks like fun mate. Welcome back. Missed seeing you around. I been flying a new screamer and listening to those low kv motors it sounds like your spinning 30 inch props at about 25 rpm hehe. Hey any updates on the submersible project or is that a strictly good weather thing for summer? WOW! Amazing. That looks so hard. Thanks Psyborg! Good to hear from you again as well. Yea it's almost like half the reason I fly with 6" biblades is because of the sound. Its immediately distinguishable compared to the 5" triblade wielding quads flying around. The ROV submersible project is still going, but pretty slowly. 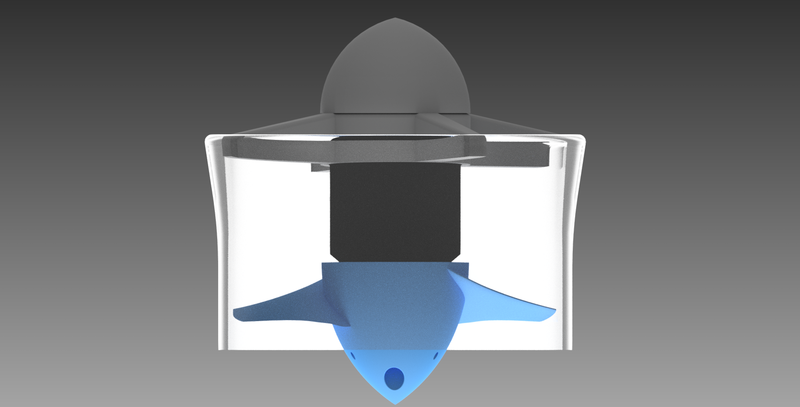 I finished the design for some 10W LED lights, and the new thrusters. Main roadblock right now is learning about setting up a serial link between an arduino on the surface and an arduino on the ROV to provide all commands. There will be 6 thrusters, the LED lights, some pan/tilt servos, and a grabber arm, so having a tether with 1 wire = 1 signal is not very feasible. I am wanting to ramp up progress on the project in the coming weeks. For now here is a cool rending of a thruster. Thanks mayan! The difficulty really depends on the pilot, the plane and communication. In this case the wing is quite fast and agile, but the pilot was communicating his intended moves so that I knew what to expect.